Stephanie says, "I tried embossing one of my Gelli Prints with a Darice Fancy Snowflakes embossing folder, and the results were pretty much lost in the pattern of the background. Next I tried applying Lawn Fawn Blue Jay ink direct-to-paper and the embossed texture came to life. I love the results. Sentiment is from The Ton Holiday Lyrics and Flower Bling that is new from Eyelet Outlet (I thought the shape echoed the snowflakes in the background)." Lauren says, "I confess that although I have plenty of beautiful embossing folders, I tend to forget all about them until there is a specific challenge that involves embossing, lol. Luckily, this one gave me a chance to use one of my favorite snowflake folders, on watercolor paper, then dry blend gelato crayons onto the raised snowflake areas. I've also used some beautiful hand-dyed crinkly ribbon that for some reason looks terribly odd and a bit grimey in the photo, but is quite lovely IRL. Meanwhile, my layout is based on the awesome current (#482) Sketch Saturday." Of course we cannot wait to see what you will make! Link up here by 6pm (EST) on Wednesday, October 11th. Keyword for galleries and Flickr is JB:17:20. 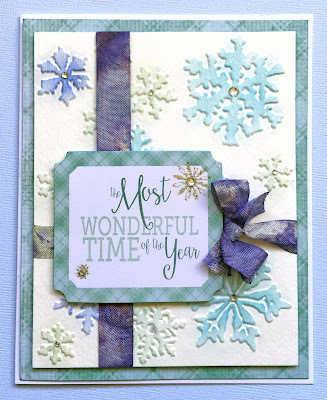 ...rocked the middle column of the board (snow/cardstock/blue) in a big big way with an adorable trio of polar bears! ...coincidentally used exactly the same ingredients, to equally wonderful effect, but in a COMPLETELY different way! 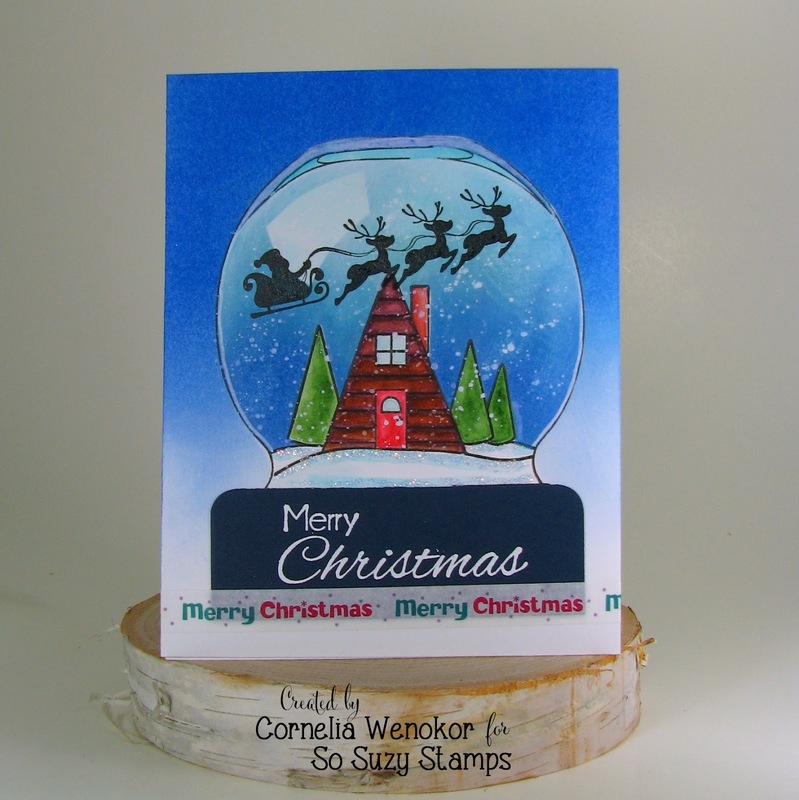 ...chose the first column (red/glitter/santa) and used each of those to perfection! Yes, it's our second week of holiday Tic-Tac-Toe, so you still have plenty of time to play along. Just choose a row, a column or a diagonal from the board and get creative, then scroll down to the original post and link up your masterpiece! 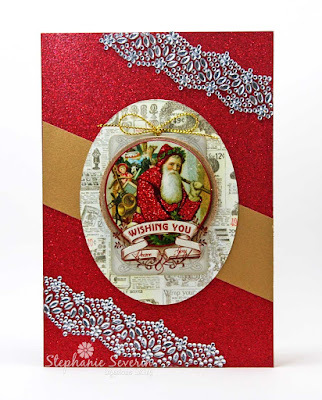 Stephanie says, "I had plans to use a different three elements this week, but when I found a red-glittered-Santa tag in my stash, I had to do a repeat of the left column ... because when life hands you a trifecta ... you use it. All I added was some amazing bling strips from Eyelet Outlet to finish my glittery design." 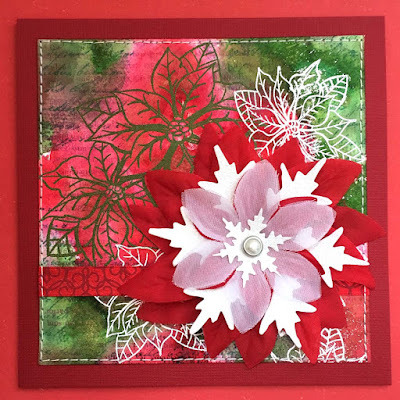 Lauren says, "I chose the top row this week so I got to combine RED (in the form of Alizarin Crimson ColorBurst, deep red cardstock and two-toned ribbon); plus SNOW (in the form of glitter paper diecuts of several sizes); and FLOWERS (that I've stamped in the background, as well as layered in the snowflake stack)!" Scroll down to the original post to see the glorious readers' gallery and to link up your masterpiece! 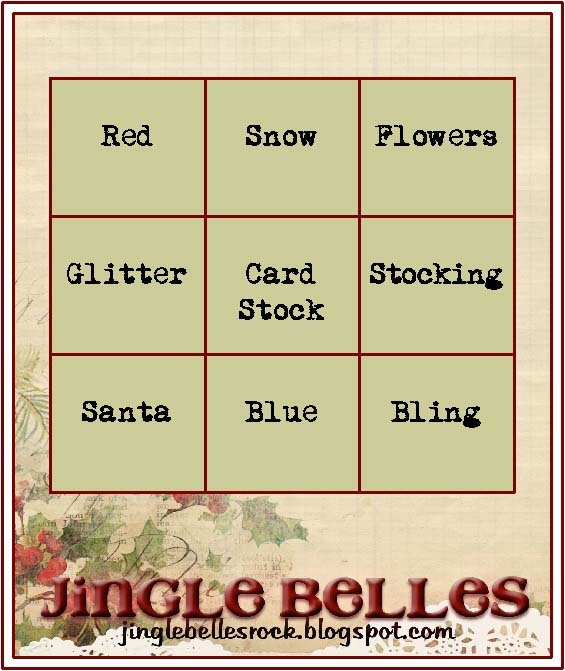 Yes, it's that time again, when we bust out the ever popular holiday Tic-Tac-Toe game and invite you to pick a row, a column, or a diagonal; then make a card using those three things and link it up! Lauren says, "I chose the left hand column, "red... glitter... santa". 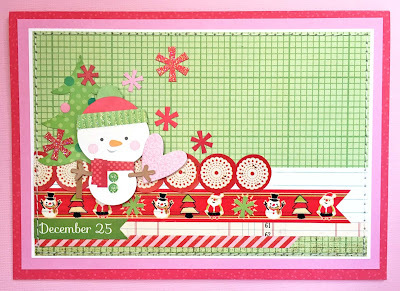 The red is pretty visible, and the Santa element is on that sweet Eyelet Outlet Santa and Snowman washi tape. Admittedly the glitter is a little hard to see, but the Doodlebug snowman and some of the the snowflakes are glittery stickers. I mention this because I know some people do not enjoy having loose glitter in their homes, and these are a great "work around". 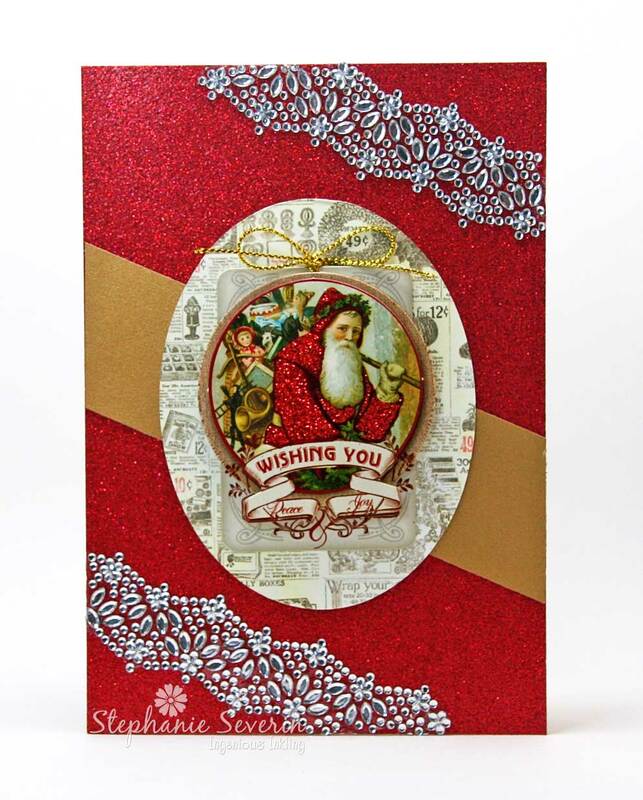 As are Eyelet Outlet glitter washi tapes and American Crafts "POW" glitter papers; both of which also diecut beautifully!" 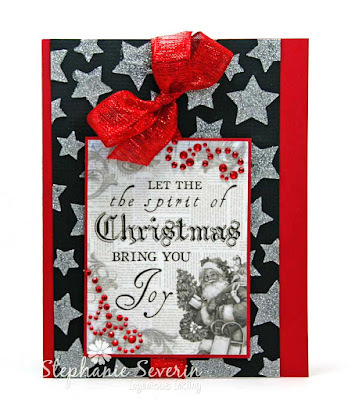 Stephanie says, "I usually avoid glitter like the plague, but this week I built my card around it ... I used Bo Bunny Silver Glitter Paste with my ARTplorations Oh My Stars! Stencil on black cardstock for my background. I went with the left column too with Red & Santa as my other two Tic-Tac-Toe elements (I always find it awesome when Lauren & I use the same inspiration, but get such different results) and threw in some deconstructed Eyelet Outlet Red Swirl gem bling & glittery red wired ribbon as finishing touches." Of course we cannot wait to see what you will make, so choose any consecutive strip and start creating! Link up here by 6pm (EST) on Wednesday, September 27th. Keyword for galleries and Flickr is JB:17:19. So much musical loveliness in the gallery for this prompt ... here are a few we thought were particularly molodic. 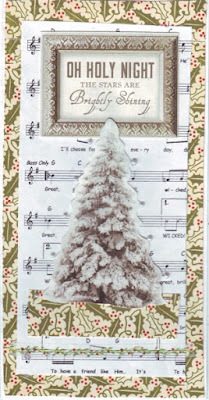 created a gorgeous collage on a sheet music base in beautiful holiday tones. "Santa Claus is Coming to Town". to frame her modern silhouette Christmas tree. 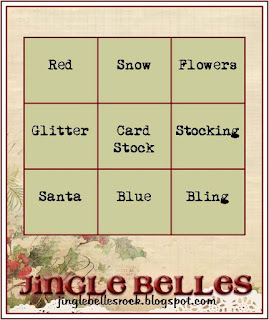 Thanks so much for going a' caroling with the Jingle Belles ... come back at midnight for a little fun & games. 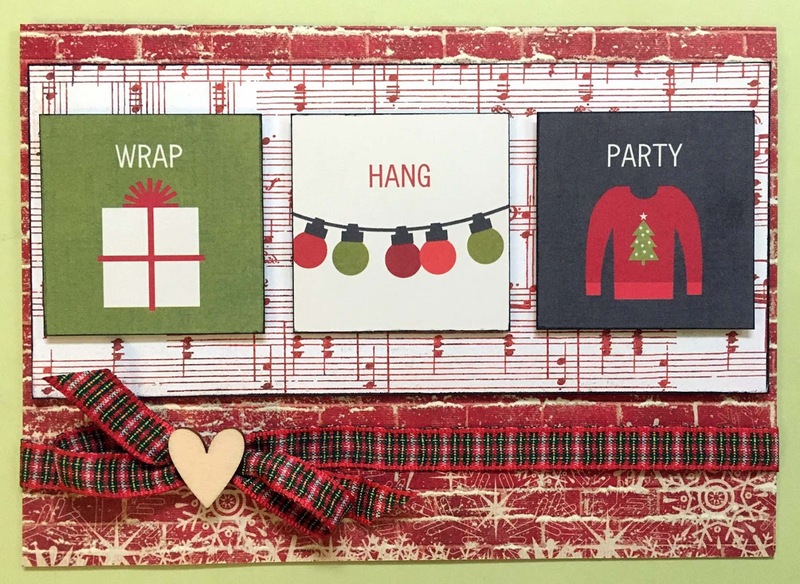 This week we're continuing to make cards inspired by our favorite Christmas Music (or making cards that incorporate Sheet Music is another option). 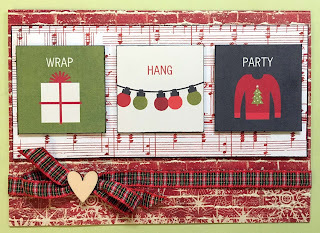 Lauren says, "I went uber-simple this week and used all ready made bits, including this ancient piece of red metallic sheet music patterned paper that I was saving for 'just the right thing' lol. 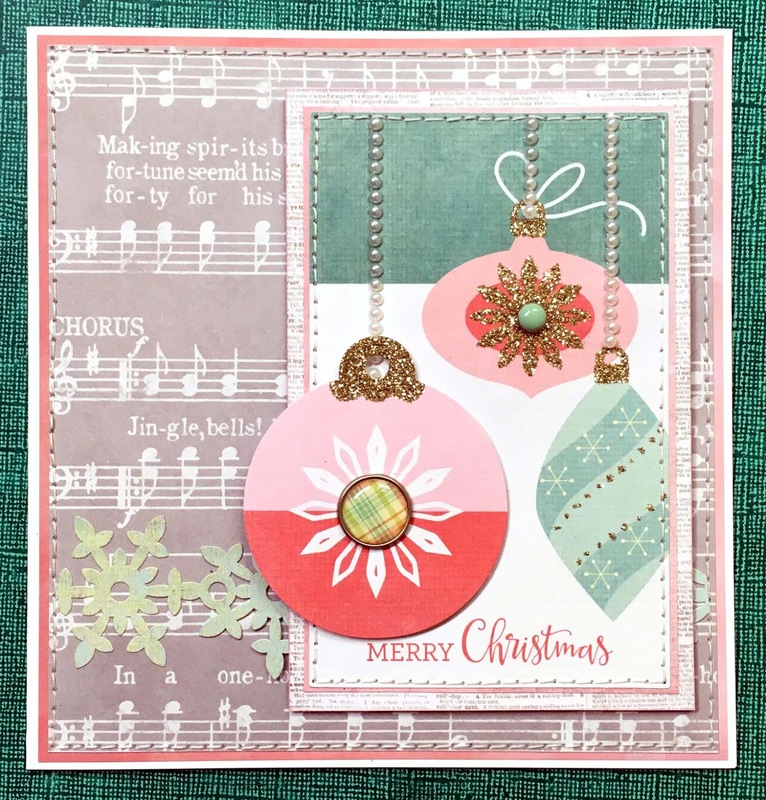 I'm kind of in love with the spare, graphic style of those little square journal cards, and they were absolutely the PERFECT way to interpret this week's fab layout from Sketch Saturday imo!" 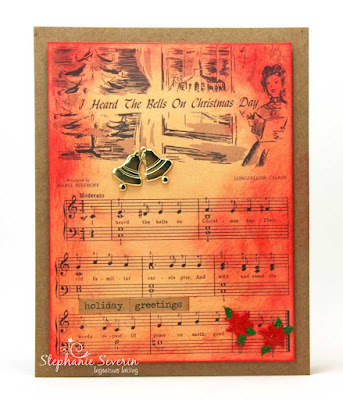 Stephanie says, "This card is inspired by one of my favorite Christmas carols that for years I sang for at least one church service during every holiday season. I love the words and the powerful melody. 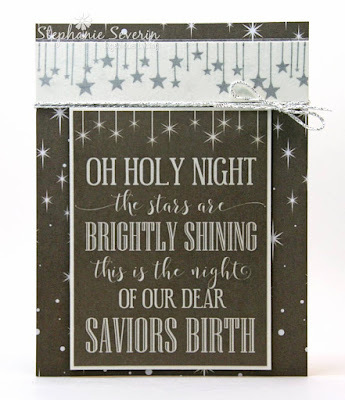 Papers are from PhotoPlay's Luke 2nd Collection accented with Silver Star Washi Tape from Eyelet Outlet and a wrap of silver cord." I have always loved Christmas Caroling ... standing in the cold crisp air singing my favorite songs at the top of my lungs ... just soaking-up that Christmas spirit. 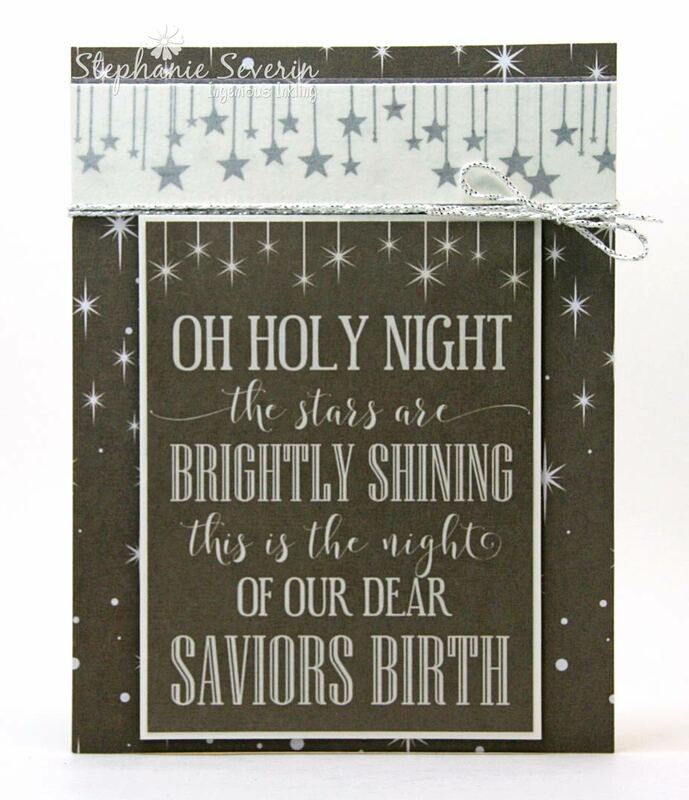 So this week we are making cards inspired by any holiday song. It might be one that evokes childhood memories ... or a more modern tune. Just let us know which holiday song inspired your design ... OR you can use Sheet Music in your card design (or both for bonus points). 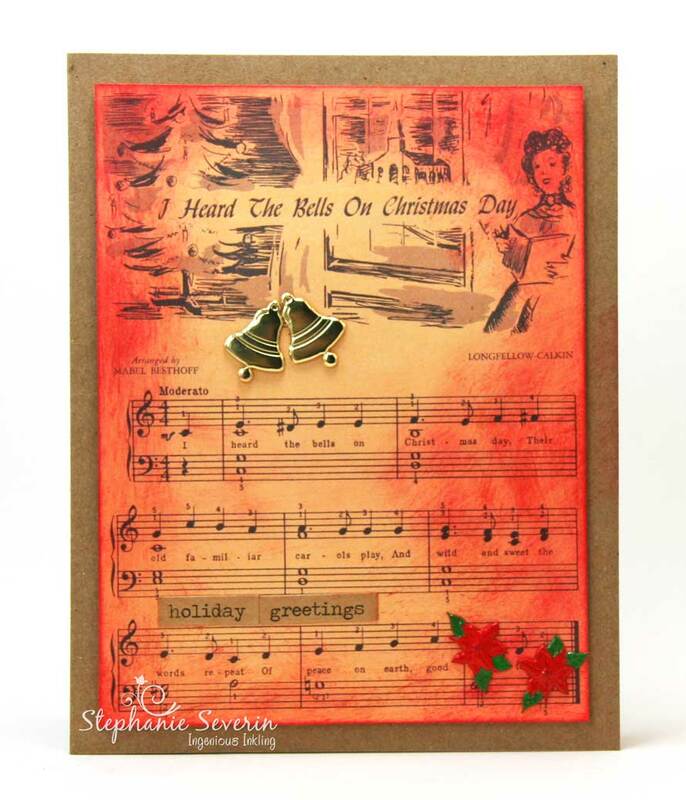 Stephanie says, "I started by scanning in a piece of vintage Christmas music from a beginner piano song book. I actually remember learning to play the carols from this beginner piano book. I loved being able to play songs where I could sing along. It also reminded me of how much fun I had playing the bells (xylophone) one year at the city-wide interdenominational Christmas service. I intended to sponge my music with antique linen ink, but somehow managed to grab a sponge that had previously been used with red ink ... I called it a *happy accident* and actually love the end result. I highlighted my music with Eyelet Outlet golden bell brads & a few poinsettia brads to anchor the corner. 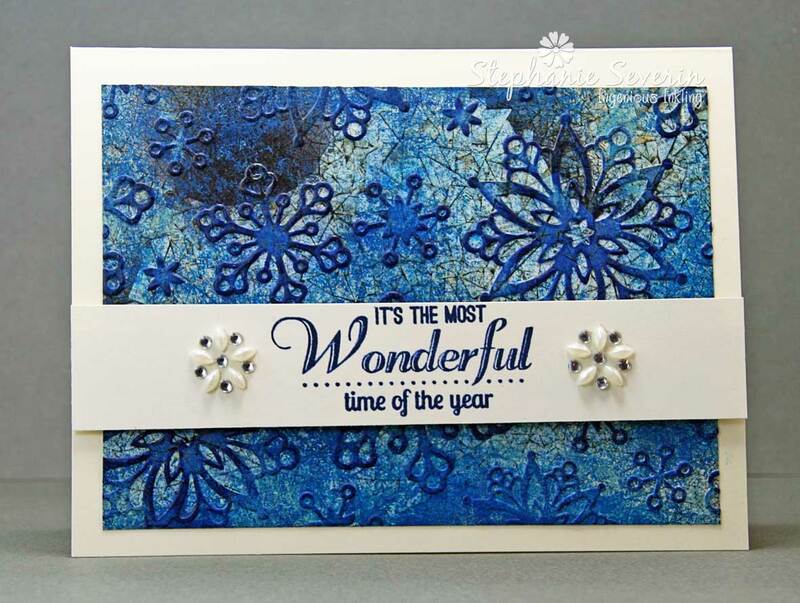 Since I was joining the Krafty Challenge at My Time to Craft, I used a kraft card base and kraft sticker sentiments to finish the design." Lauren says, "I was inspired by this beautiful greyish/taupe sheet-music-inspired patterned paper from a Crate Paper collection several years ago. 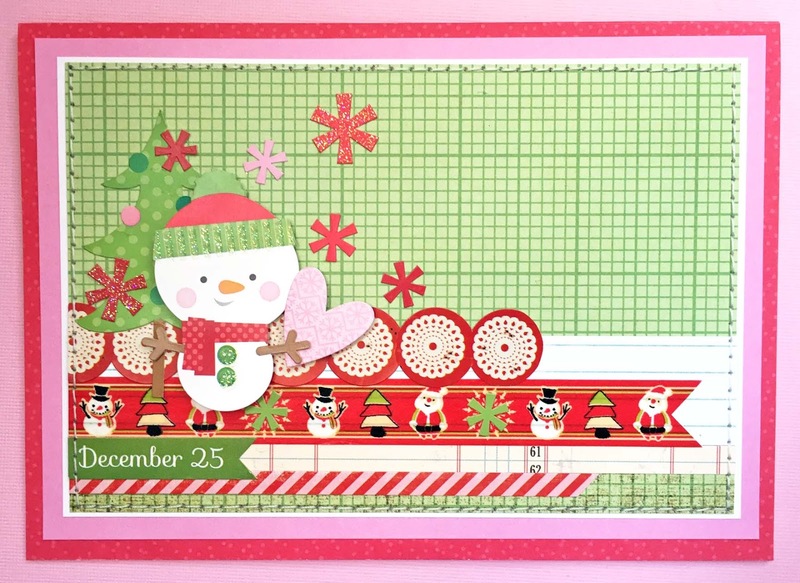 I added a diecut ornament, a couple of brads and a matching journal card from My Mind's Eye, and used mats made from patterned paper scraps in coordinating colors. Oh and I couldn't resist glamming up the hangers with some Eyelet Outlet Pearl Strips. I used the current Sketch Saturday layout, though admittedly, I've done a pretty loose interpretation." 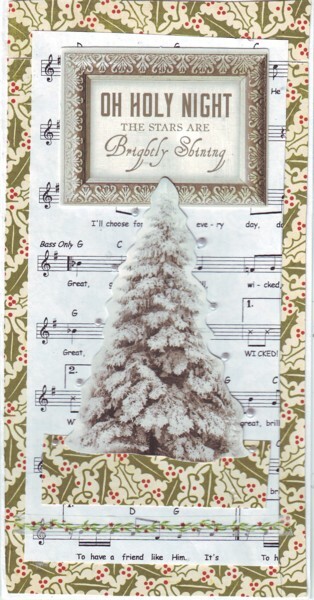 So break-out your sheet music OR start humming your favorite holiday tune; then show us your creations. Link-up here by 6pm (EST) on Wednesday, September13th. Keyword for galleries & our JB flickr Gallery is JB:17:18.